Bats have undergone intensive diversification that has made them the second most species-rich group of mammals. A key component in this adaptive radiation has been the animals' evolutionary ability to adapt the function of their biosonar systems to a wide variety of sensing tasks. The outer ears (pinnae) of the world's approximately 1,200 bat species differ in global and local shape features. The same holds true for the noseleaves, sound-diffracting baffles that surround the nostrils in those bat species that emit their ultrasonic pulses nasally. Important functional aspects of biosonar are linked to nose and ear shape. The diffraction of the outgoing and incoming ultrasonic waves at the surface of the ears and noseleaves determines a joint space-frequency selectivity filter for the animals' biosonar that can be viewed as a correlated shape in a three-dimensional space spanned by two direction angles (e.g., azimuth and elevation) and frequency. The shape of individual space-frequency biosonar filters can be predicted from detailed digital representations of individual ear or noseleaf shapes using numerical methods. The functional significance of the filters to different biosonar tasks can also be quantified using methods from estimation/information theory as has been done in the case of target localization. 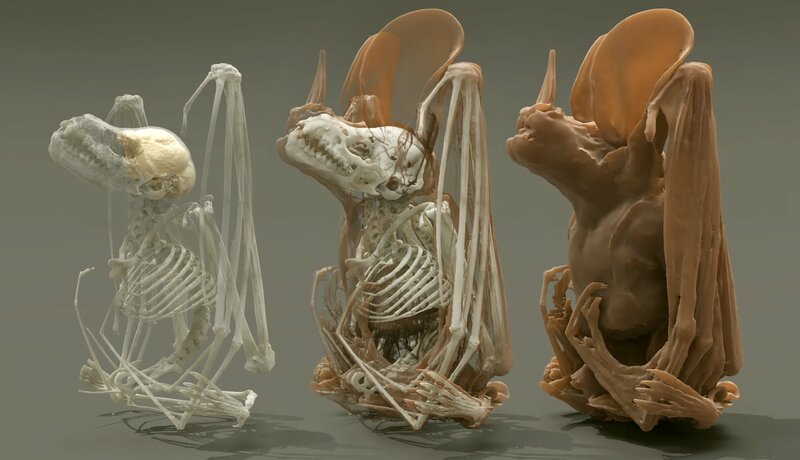 Micro-CT models of static noseleaves and outer ears, high-speed stereo video images of outer ears actively deformed by live bats are available for this investigation. Numerical estimates of beampatterns can be obtained as functional correlates of shape. The central challenge for this model system is understanding the evolutionary relationships between two complicated 3D shapes, one describing morphology and the other function -- in the course of evolution. This is not possible with current methods and requires the analysis of shape that we propose to develop. To address this, one needs to find two shape spaces, one for morphology and one for function. While the general relationship between a sound diffracting shape and the joint-space frequency filter it creates is too complex to be understood in intuitive ways, the subspace that has actually been occupied by the adaptive radiation in bats may have a structure that is simple enough to be described in terms of intuitive evolutionary trends. The goal of the bat work is to find suitable shape spaces and to arrive at such descriptions. Bates, Jonathan, and Washington Mio. "Density Estimators of Gaussian Type on Closed Riemannian Manifolds." Journal of Mathematical Imaging and Vision (2013): 1-7. Martinez, Diego H. Diaz, Facundo Memoli, and Washington Mio. "Multiscale Covariance Fields, Local Scales, and Shape Transforms." Geometric Science of Information. Springer Berlin Heidelberg, 2013. 794-801. Mander, Luke, Mao Li, Washington Mio, Charless C. Fowlkes, and Surangi W. Punyasena. "Classification of grass pollen through the quantitative analysis of surface ornamentation and texture." Proceedings of the Royal Society B: Biological Sciences 280, no. 1770 (2013): 20131905. D. Diaz Martinez, F. Memoli, W. Mio, Covariance Tensor Fields for Manifold Clustering, submitted in 2014. Muller, Rolf, Jianguo Ma, Zhen Yan, Cindy Grimm, and Washington Mio. "Bioinspiration From Biodiversity in Sensor Design." In ASME 2011 International Mechanical Engineering Congress and Exposition, pp. 825-834. American Society of Mechanical Engineers, 2011. Muller, Rolf, Lvyin Cai, Cindy Grimm, and Washington Mio. "Shape space analysis of structures in bat biosonar." The Journal of the Acoustical Society of America 129, no. 4 (2011): 2507-2507. A. Cinquin, M. Chiang, A. Paz, S. Hallman, O. Yuan, C. Fowlkes, O. Cinquin "Stochastic cycling balances stem cell self-renewal and senescence"
M. Chiang, S. Hallman, C. Fowlkes, O. Cinquin, "In vivo analysis analysis of single cell behavior by three-dimensional spatial cytometry"
C. Fowlkes, K. Eckenrode, M. Bragdon, M. Meyer, Z. Wunderlich, L. Simirenko,C. Hendriks, S. Keranen, C. Henreiquez, M. Biggin, M. Eisen, A. DePace, "A conserved developmental patterning network produces quantitatively different output in multiple species of Drosophila," PLoS Genetics, 7(10): e1002346, 2011. J. Hengenius, M. Gribskov, A. Rundell, C. Fowlkes, D. Umulis, "Analysis of Gap Gene Regulation in a 3D Organism-Scale Model of the Drosohpila melanogaster Embryo", PLoS ONE 6(11): e26797. doi:10.1371/journal.pone.0026797, 2011. A. Chen, D. Lieu, L. Freschauf, V. Lew, H. Sharma, J. Wang, D. Nguyen, I. Karakikes, R. Hajjar, A. Gopinathan, E. Botvinick, C. Fowlkes, R. Li, M. Khine, "Shrink-Film Configurable Multiscale Wrinkles for Functional Alignment of Human Embryonic Stem Cells and their Cardiac Derivatives", 10.1002/adma.201103463, Advanced Materials, 2011. This material is based upon work supported by the National Science Foundation under Grant No. DBI 1052942, 1053036, 1053024, 1053171, 1052925, 1053130, 1052688, and 1052997.